It has been a while since I last posted on this site. I have been completely bogged down by work, more work, and paper work. Every time I get an idea or a start a new post, life got in the way. Granted, I have taken on a few new leadership positions this year and I am coaching at a different school. So here’s a few things worth note as I get back into the usual routine. 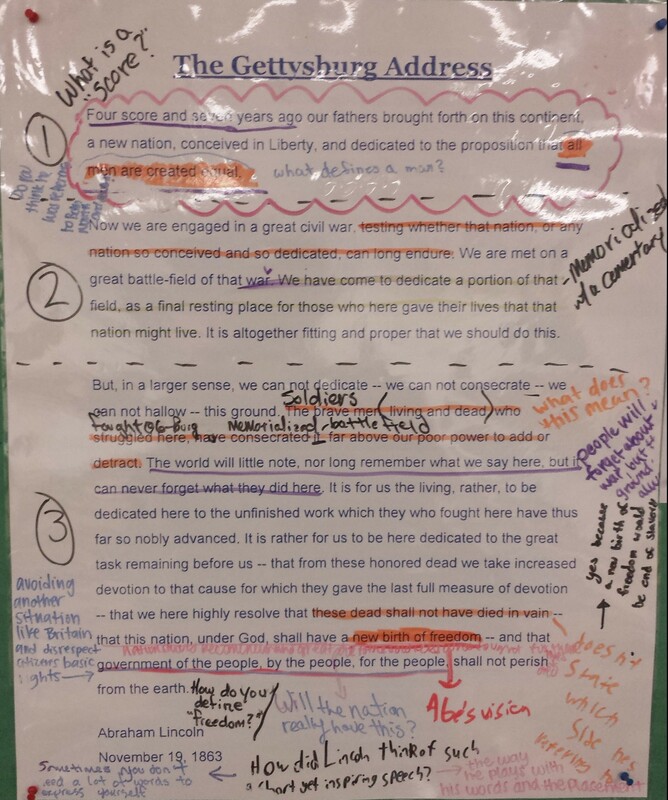 The Gettysburg Address in the classroom. My U.S. History classes recently engaged in an activity with Lincoln’s Gettysburg Address. I teach four U.S. History classes throughout the day and I decided I wanted my students to carry on a conversation with each other and to use Lincoln’s words as a medium. Here is the result (picture). Each student got an individual copy on which they highlighted, underlined, and engaged. They wrote down questions, feelings, facts, opinions, ideas, and connections. A few of those students came up and wrote on my enlarged copy. This copy stayed up for the entire day as each class repeated the process. Some classes built on the questions on the questions of previous classes and created some of their own. Other students answered the questions left by the classes before them. The end results is this marked up copy of Lincoln’s famous words. H/t to my students for playing along. On November 5th (“Remember, Remember the 5th of November…”) the hacker group “Anonymous” released a list of supposed KKK members on pastebin.com. I think it is safe to say that the people on the list included more than just members but also alleged sympathizers. Included on the list are Virginia Flaggers very own Susan Hathaway and Grayson Jennings. One “special” student arrived at East Coweta High School on Wednesday November 18, wearing a Ku Klux Klan hood and carrying a Confederate Flag. Someone took a photo of the student and posted it to social media. Once administration became aware of the photograph, they launched an immediate investigation, identified the students involved, and are disciplining the students. The school sent a letter home to parents which stated:The Cowetta County School system does not allow behavior that infringed on the safety of its students, its staff, or volunteers, and does not tolerate behavior intended to bully, harass, or intimidate others on our campuses. As a teacher myself, I know students can be real knuckleheads. They are kids after all. Hats off to the school administrators who acted without hesitation to address the situation. Hopefully they can use it as a learning opportunity and a dialogue about race. Check out Andy Hall’s post about the execution photos of Henry Wirz, the Commandant of Andersonville Prison Camp. Finally, check out “The Continuing What-ifs of Reconstruction,” Brooks Simpson’s excellent response piece to Annette Gordon-Reed’s recent article about Reconstruction. It could not have come at a greater time. I began teaching Reconstruction this week and this insightful post definitely gave me a lot to think about.